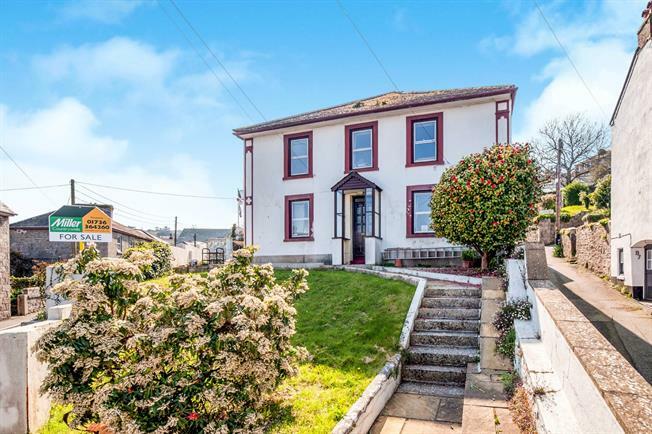 4 Bedroom Detached House For Sale in Penzance for Guide Price £325,000. Fairholme is launched to the market for the first time since the late 1970's. This double fronted house has a lot of space and versatility, coupled with many remaining traditional features and although in need of some cosmetic repair this property hosts plentiful living accommodation and detached workshop with commercial purposes if desired. Double glazed door to rear utility, double glazed window to rear aspect, range of base and wall units. Door into dining room. Radiator and stairs rising to first floor. Double glazed window to front aspect, exposed granite wall and radiator, opening into lounge. Double glazed window to front aspect, exposed granite wall, fireplace and radiator, opening into dining room. Space and plumbing for washing machine and space for dryer. Double glazed door to rear courtyard garden. Double glazed obscure window to rear aspect, W.C, wash hand basin and bath with shower over. To the rear of the cottage there is a good sized sunny courtyard. The property has rear access to Duke Street Car Park.